My first proper baby-related review goes to one of the most important items in our baby boy’s nursery – the Tutti Bambini Katie Cot Bed. 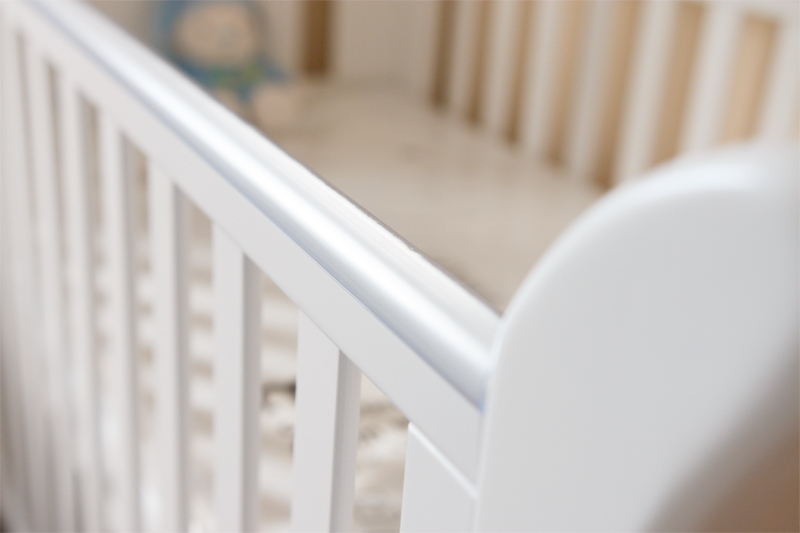 The decision of which cot to buy for our soon-to-be firstborn was one that took us months; we had to consider lots of variables before choosing the right cot for us and our baby – price, size, value for money, style, colour and durability. I hope writing about our experiences and decision-making process behind the purchase of this cot, along with a an overview of its features, may be helpful to prospective parents or grandparents looking to invest in this cot. 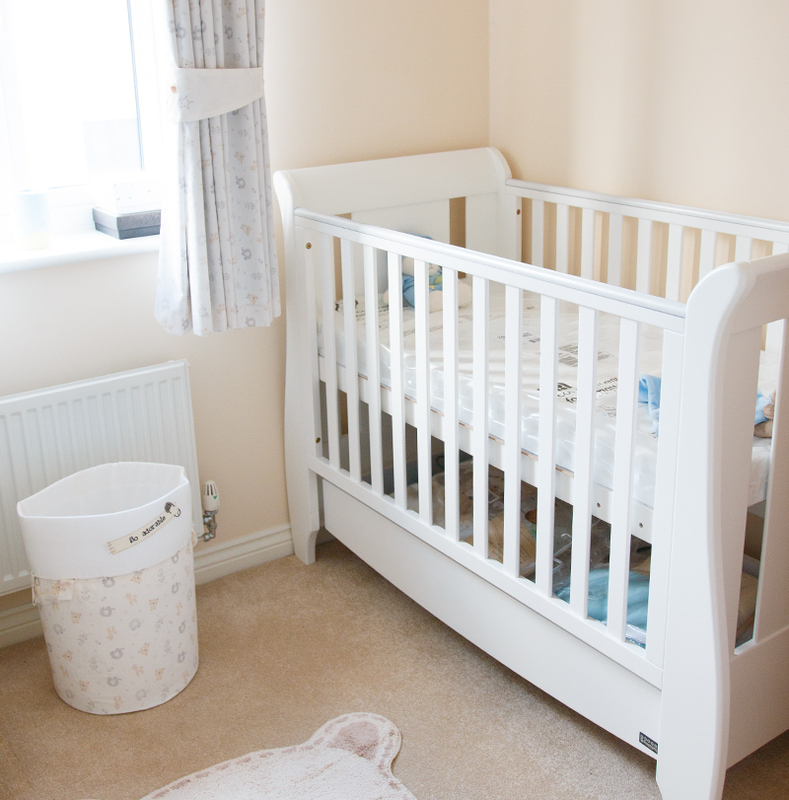 If nothing else, you can enjoy having a little look at bits and bobs from our baby’s nursery! Before I tell you about the cot, let me start by telling you what were our priorities when we started looking for a cot. First, our baby’s nursery room is tiny, so we had to find a mini cot to fit in the space we have, and therefore, most regular-sized cots were already out of the question. Price-wise, we weren’t looking to spend a fortune, but we wanted something that was durable enough for a possible second baby in the future, made from solid wood and with integrated storage so we can make the most out of the small space we have. In terms of style, we wanted something simple, elegant, timeless, quite neutral and peaceful-looking. After months of researching, the Katie mini Cot stood out to us, so last month we finally took the plunge and decided to order the it from Mothercare. According to our research, Mothercare offered the best value for money; Precious Little One via Tesco Direct had the cheapest price, but charged for delivery, in Boots it was slightly more expensive and they charged for delivery and in Mothercare it was only a few pounds more than in Precious Little One, but they offered free delivery within 5 working days, so that worked out as the best deal for us. The Tutti Bambini Katie Cot Bed is a sleigh style mini cot made from solid pine wood. It has an integrated drawer for storage, teething rails on both sides and it can be used from birth to approximately 3 years. It can be used as a cot, converted into a junior bed or a sofa, so it’s plenty versatile to suit the needs of your little one and to be an adaptable piece of furniture in your house. 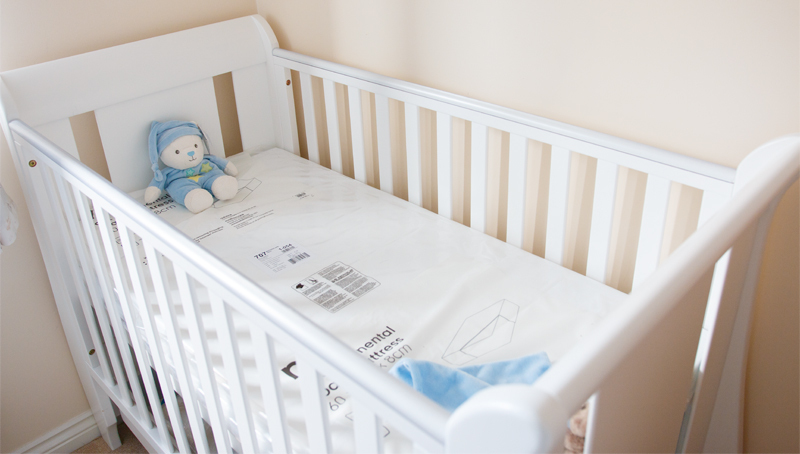 The cot has a three-position adjustable mattress base, which can be changed to suit your baby’s height as they grow up. The exact dimensions are: Height – 102cm; Length – 138cm; Width – 67cm; Weight – 37kg. Being a mini cot, the dimensions are slightly smaller than a standard-sized cot, but not too small that you would immediately notice a huge difference – it suits parents, like us, with a small space for a nursery, and anyone looking for a neat cot. Whilst a regular-sized cot tends to fit children up to the age of 5, a mini cot is only recommended up to 3 years old, but by then, we will probably be rethinking the sleeping arrangements anyway. If you’re looking for a regular-sized cot, the Tutti Bambini Lucas Cot Bed is pretty much the same as the Katie cot, but bigger. The sleigh design of this cot was something we both loved from the start; its charming contours and curves makes the cot look more expensive than it actually is, especially in real life. 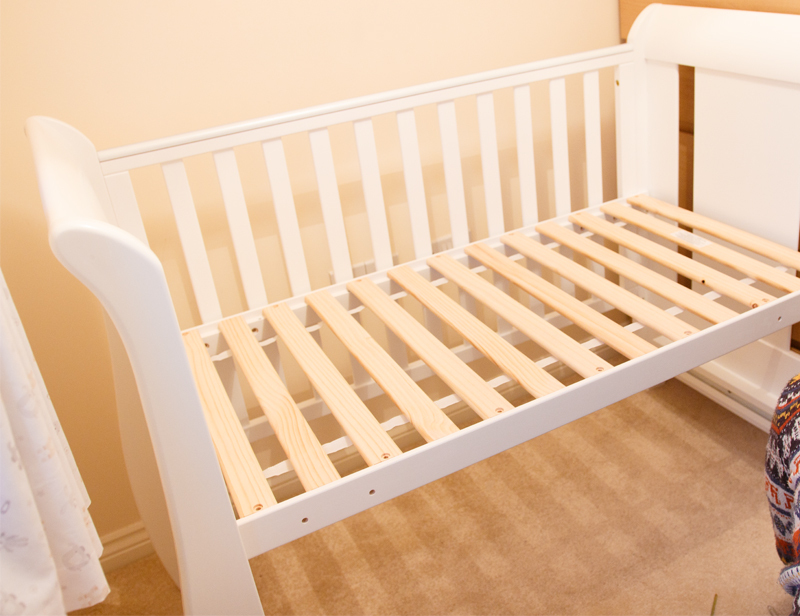 The Katie cot bed is available in two different colours – white and espresso. We went for white, as it suits our taste and our home decor a bit more. Supposedly, the espresso colour model has a dropside mechanism which is not present in the white version, but I wasn’t able to confirm with Tutti Bambini, so don’t quote me on this. All I know is that our white Katie cot has a fixed-side, despite it being advertised as being a dropside cot on the Tesco Direct website. 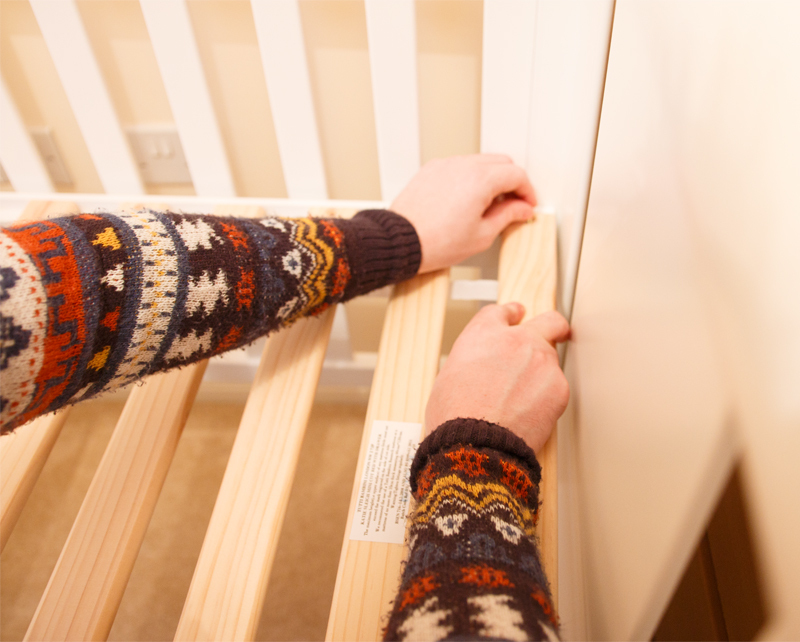 The cot comes flat-packed, so it requires self-assembly and if you’re heavily pregnant at the time of building it like I was, you might want to enlist the help of your partner or friends and family. My husband was kind enough to take charge of the job of building it, and with the help of his father, it only took him a couple of hours, at most. 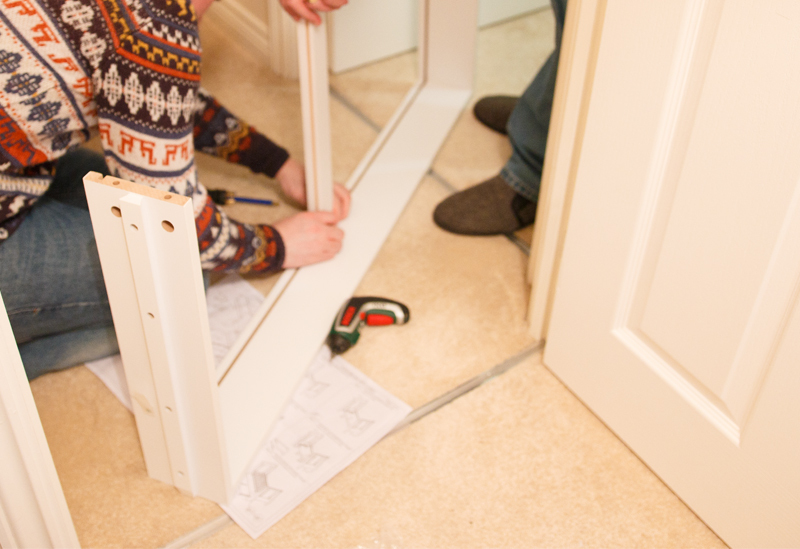 His feedback on building the cot was very good – he thought the instructions were clear enough and had no problems at all building the cot with minimal tools, which was great. We are very impressed with the quality and the looks of this cot, and we think it looks even better in real life than it does in pictures. The integrated drawer is a huge bonus, and contrary to most cots with drawers, the drawer in the Tutti Bambini Katie cot is not just sitting on the floor, underneath the cot – it’s properly built-in. We only found a tiny little chip on the inside nook of one of the end boards, but once the cot is built it’s not visible at all, and considering is was a rather budget-friendly cot, I can’t really complain as everything else was as expected. In terms of the service we had from Mothercare, we rate it as excellent! The cot arrived within 4 days of ordering it, and we were kept updated on the whereabouts of our cot all the way until delivery. The courier was kind enough to bring the box into my hallway, which was really helpful, as the box was extremely heavy and there was no way I could have lifted that box all by myself. We also bought a cot mattress from Mothercare to go with it, which came in a separate delivery, but arrived before the cot. Because the Tutti Bambini Katie is a mini cot, you have to get a smaller 120cm x 60cm cot mattress; it’s easy enough to find at most stores and we went for a regular foam mattress. All in all, I highly recommend the Tutti Bambini Katie Cot Bed if you’re looking for a small, pretty, great quality, affordable and versatile cot for your baby. 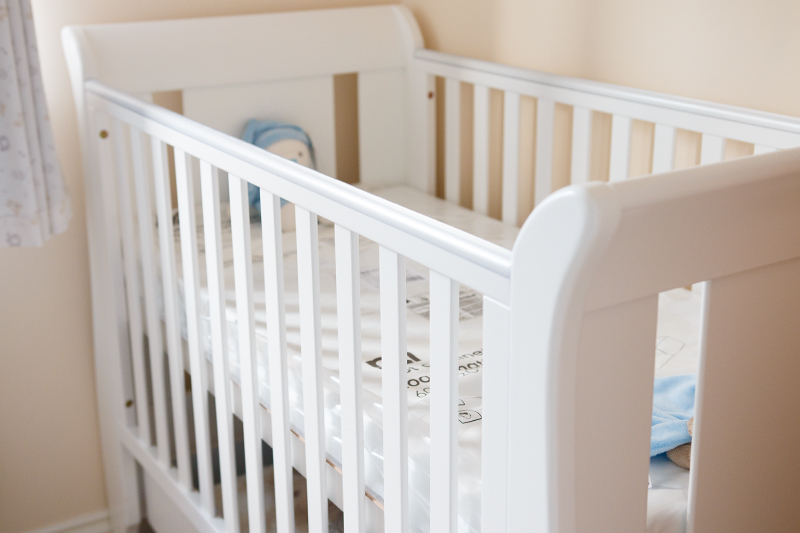 We couldn’t be happier with the cot we chose and we love looking at it in the nursery – we literally cannot wait for our little one to try and test it so we can properly let you know if he also approves it! I also recommend getting it from Mothercare, as we had a great experience shopping with them and no difficulties at all. To see this cot in context with all the other matching furniture, watch the Tutti Bambini promo video on their website – I’ve decided to get matching nursing chair as well, so let me know if you would like to see a review when it arrives. What do you think of the Tutti Bambini Katie Cot Bed? 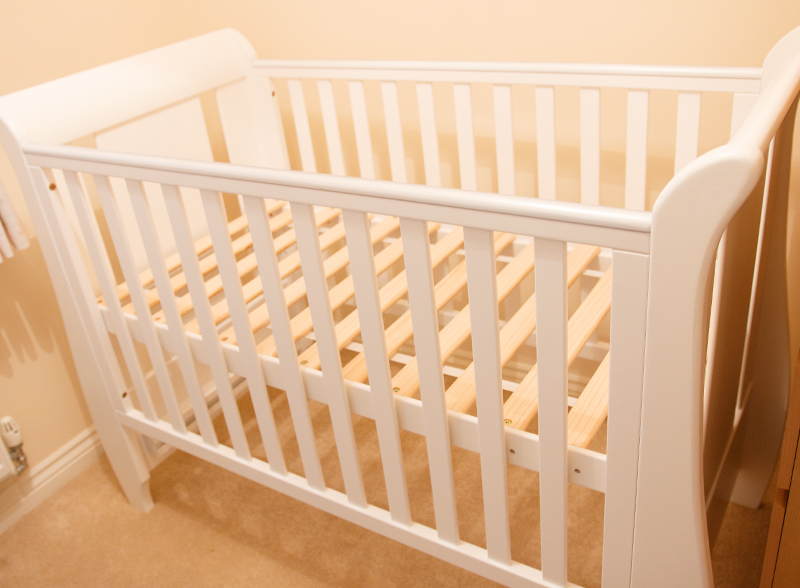 What are the important factors for you when choosing a cot or cot bed for your baby? I hope you found this review useful – if you did, make sure to let me know on the comments below. 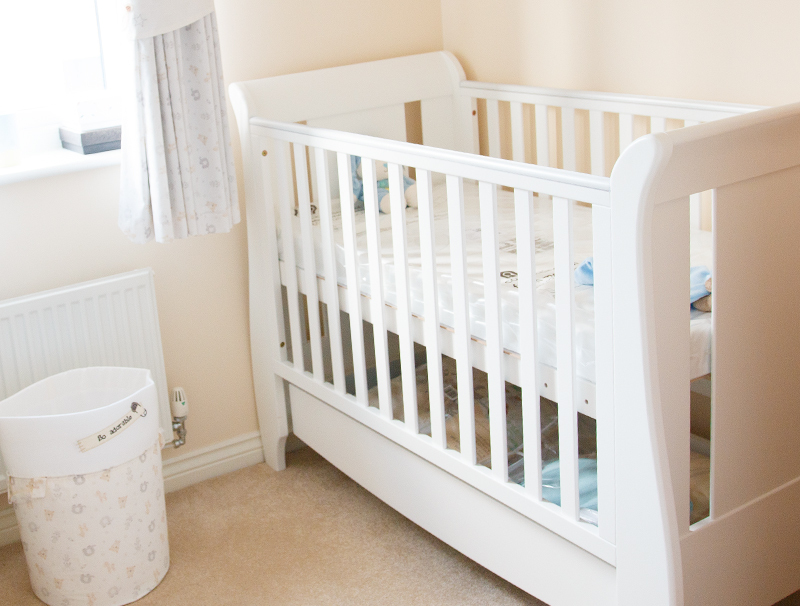 * This is not a sponsored post; we bought the cot with our own money and I wasn’t paid by any of the companies or brands mentioned on this post to talk about this cot – I truly love it! 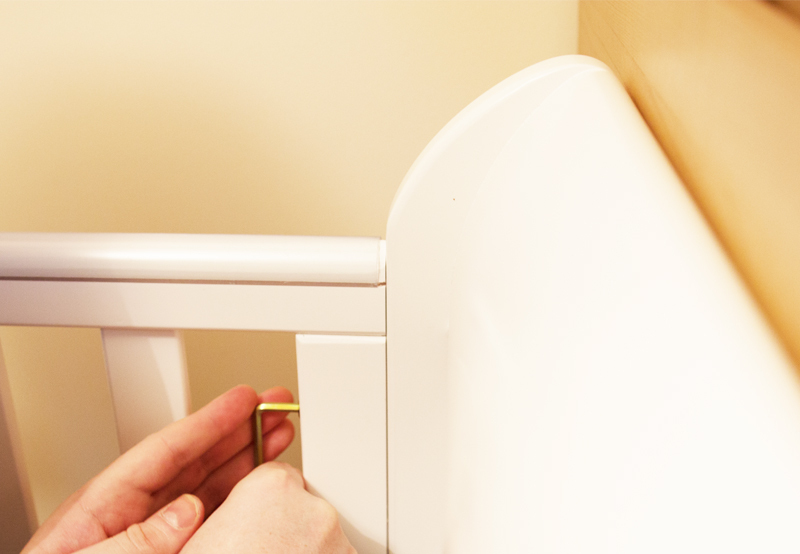 Hi Ysis, please can you tell me whether the drawer on this cot is easy to pull and push? Is it on rails and does it have a soft close feature?